JNN 18 Sept 2014 TEHRAN – Iranian President Hassan Rouhani has said that the anti-terrorism coalition of the countries that had trained, equipped and financially supported terrorist groups is like a “joke”. President Rouhani made the remarks during a meeting with Slovak Foreign Minister and Deputy Prime Minister Miroslav Lajcak in Tehran on Monday. “However, we believe that if any country sincerely announces that it seeks to fight against terrorism from now on, their penitence should be accepted,” he added. 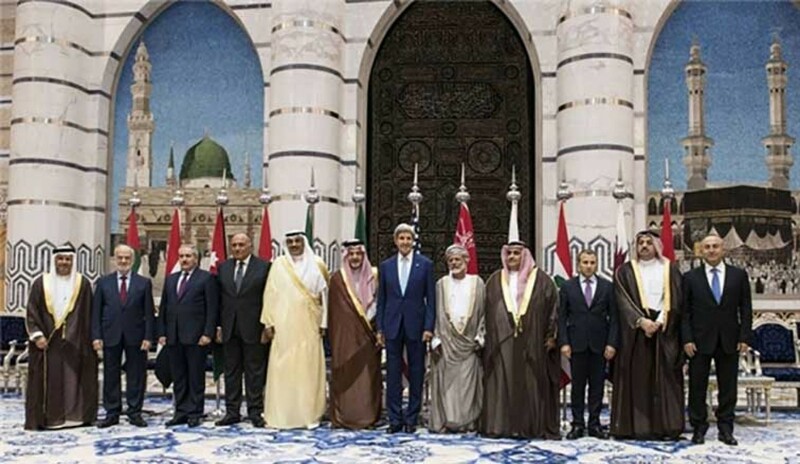 In a Thursday meeting in Jeddah, Saudi Arabia, Qatar, Bahrain, Kuwait, Oman, the United Arab Emirates, Egypt, Iraq, Jordan, and Lebanon agreed to join the United States and some other NATO member states in fight against ISIL in Iraq and Syria. The Iranian president pointed to the fact that terrorism is a growing threat to the world and urged the entire world to cooperate in fight against terrorism. There are lots of concerns regarding regional issues such as the situation of the Palestinians in the Gaza Strip and crimes being committed by terrorists in Iraq and Syria, Rouhani said, adding that there are concerns about security and stability of the other countries throughout the world, as well. The Guardian reported that Syria again stated that airstrikes on its territory without its cooperation would be a “big mistake” and a “big crime”. Syrian Deputy Foreign Minister Faisal Mekdad insisted that the Syrian government has been fighting ISIL “from the beginning” and has never accepted its presence. Iran should join the campaign against the terrorist group ISIL, Iraqi President Fuad Masoom told the participants of a conference held in Paris to coordinate a strategy against the Islamic State of Iraq and the Levant. Iraq’s Hezbollah Battalions in a statement issued on Monday strongly rejected any cooperation with the US-led coalition against Israeli State of Iraq and the Levant. “The coalition being formed against the ISIL which is led by the US is a prelude to a new occupation plot,” part of the statement said. The Hezbollah Battalions urged the Iraqi nation to be vigilant against the scenarios of the West, specially the US, and their mercenaries in the region, implying that the ISIL is working for the US. “We believe that demanding help from the US means a confiscation (by the US) of the Iraqi nation and people’s resistance against terrorism and the pain and agony that they have had to suffer for protecting Iraq’s unity,” the statement said. “We believe that the US is responsible for Iraq’s problems and challenges and we do not have any hope in the United States,” it added. The Battalions also urged Iraq’s religious authorities and elites as well as other layers of the society from different walks of life to take straightforward stances about the current developments and the US meddling in the country before it’s too late. Earlier today, the Lebanese resistance movement, Hezbollah, also voiced its opposition to Lebanon’s participation in the US-led coalition against the ISIL. “Hezbollah is opposed to Lebanon’s presence in the anti-ISIL coalition led by the US and Saudi Arabia and created with the partnership of those countries supporting the Takfiri terrorist groups,” the Lebanese newspaper Al-Akhbar quoted a source close to Hezbollah as saying on the condition of anonymity. NATO heads of state convened in the Welsh city of Newport on 4-5 September and US Secretary of State John Kerry and Defense Secretary Chuck Hagel told foreign and defense ministers participating in the NATO summit that the US was forming a broad international coalition against ISIL. Ministers from the United States, the United Kingdom, France, Germany, Canada, Australia, Turkey, Italy, Poland and Denmark met in Wales to hammer out a strategy for battling ISIL, but the policy was questioned by many regional officials and political leaders. After the so-called US-led coalition against the ISIL declared its creation, Iran also lashed out at the western states for pursuing a double-standard policy towards campaign against terrorism in various countries. “Iran believes in a real and nonselective fight against terrorism in the region and the world,” Deputy Foreign Minister for Arab and African Affairs Hossein Amir Abdollahian said on Saturday. Amir Abdollahian stressed that the Islamic Republic was the first country to assist Iraq in the fight against terrorism. The Iranian deputy foreign minister also stated that Tehran will continue to fully support Iraq and Syria in the battle against terrorism. Also, Secretary of Iran’s Supreme National Security Council (SNSC) Ali Shamkhani on Saturday questioned the goals pursued by the US-led anti-ISIL coalition, and said Washington sought to violate the regional countries’ sovereignty. “The US attempts to create an anti-terrorism coalition in collaboration with certain states which are themselves the main sponsors and suppliers of the terrorists are suspicious and lack transparency,” Shamkhani said, addressing a gathering of Iranian clerics in the Central city of Qom. “The US seeks to continue its unilateralism and violate the countries’ sovereignty under the pretext of fighting terrorism,” he added. Shamkhani underlined that Washington was also attempting to distract the world attention from the pivotal role that the US and its allies had played in the establishment, equipment and development of the terrorist groups under the pretext of overthrowing the legal government in Syria. He said the United States’ move to form an anti-ISIL coalition was more like a Hollywood scenario to portray the US as a savior of the region. ISIL has taken control of parts of northern Iraq and has a power base in Syria. Masoom said that Iraq and Iran have a border of about 1000 kilometers, and Iran provides much humanitarian and military assistance to Iraq, Itar-Tass reported. The Iraqi president added that the ISIL terrorists are responsible for some of the worst atrocities committed in Iraq’s history. In the opening address to the conference, which was attended by about 30 countries ready to join a U.S.-led coalition against ISIL, French President Francois Hollande called for a global response to counter ISIL, saying the group posed a security threat to the world. “The threat is global, so the response must be global,” the French leader said. The foreign ministers and chief diplomats of France, China, Britain, the United States, Russia, several other European states, Qatar, Saudi Arabia, Kuwait, the UAE, and some of Iraq’s other neighbors are in Paris to discuss broad political, security, and humanitarian aspects of the campaign against ISIL. The Al Jazeera correspondent in Paris said the statements released by the two leaders were not specific in terms of military action. This entry was posted in Iraq News, Middle East, United States and tagged Anti ISIL Coalition, iran, Iranian President Hassan Rouhani, Iraq, Saudi Arabia, Syria, United States. Bookmark the permalink.